skeletons | Yardsaling to Adventure! Anyway as you know we moved, and we did the thing that smart people do: shipped the entirety of our worldly possessions cross-country, and then decided to cull it down a bit, after realizing we couldn’t physically fit the amount of crap we’ve amassed over the years into our new house. (This is probably Lizo’s fault, since I never amass large piles of garbage.) It was either annex our neighbors’ property—which they seemed patently unwilling to agree to—or have a yard sale of our own. As you can see, it would be exaggerating to say that business was good. It would also be exaggerating to say that any business happened at all. Bob wasn’t our only customer, but he was one of maybe a dozen—most of which were neighbors who were out walking their dogs and wondering why we had the entire contents of a Sam Goody circa 2002 dumped out on our driveway. We were asked “did you guys advertise?” at least a half-dozen times, with “because I had no idea this was even happening” politely left unspoken. Then around 11:30, we had a freak thunderstorm (the first rain we’ve seen since moving here) and most of our stuff got water-logged. It was not a very good sale. Also, our sign didn’t make it through the rain so good. 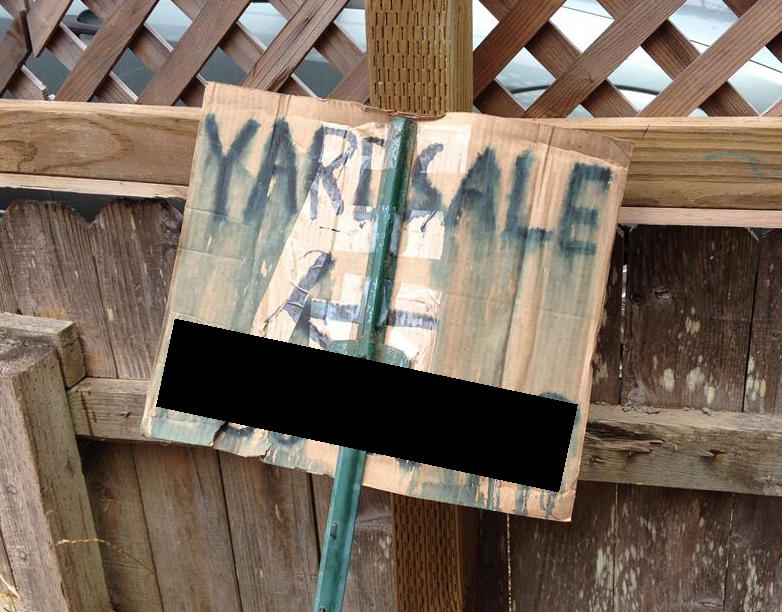 All-in-all I sort of hate yard sales now, so this is the end of the blog forever. Okay I lied. Here’s a sampling of some of the weird stuff we tried to sell to Bob! A Bouquet of Black Roses and Spiders! This was from a yardsale that appeared to be the entire contents of a Spirit Halloween store—except that they were selling everything for like, a dollar. Spooky holiday lights? A dollar. Masks so terrifying that I heard a little kid whispering “I don’t want to be here, I don’t want to be here…”? A dollar. The bouquet above? TEN CENTS. TEN FRIGGIN’ CENTS. Skeletons the size of ME cost $5, and that was seriously the most expensive thing they had. 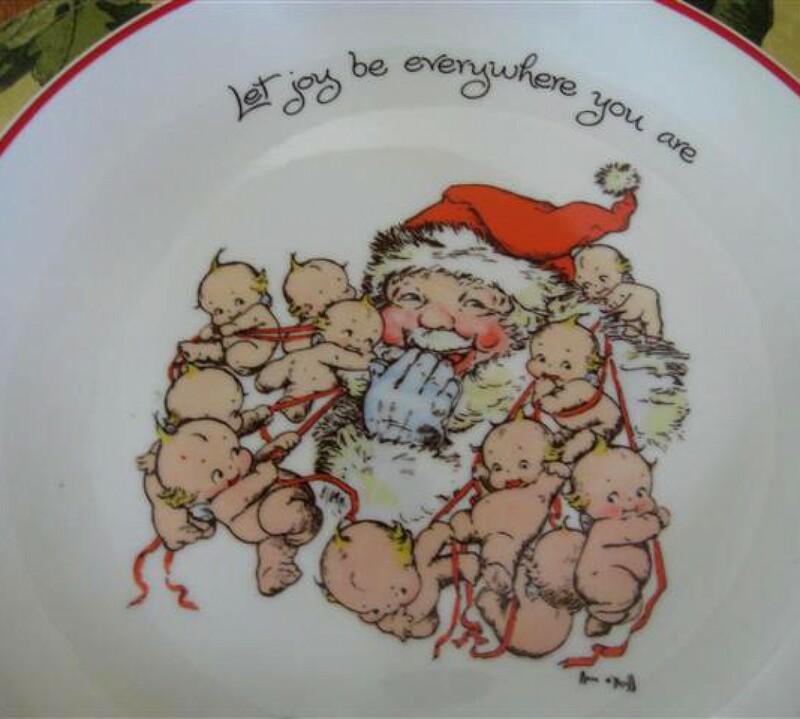 As someone who unironically lists “decorating for the holidays” as an interest on Facebook, I was SO into it. A dollar-store skeleton buried in dirt from your backyard in some old tupperware? I’ll take all you have, thank you. Today, we bring you a SPECIAL REPORT, from what is being hailed as “Connecticut’s Largest Yardsale”! When I saw the sign, I just had to go. I had no idea we even had one of those! …Yeah, it turns out we don’t—if anything it was more like “Connecticut’s Most Moderately-Sized Flea Market.” (Which, granted, probably wouldn’t have fit on the sign.) 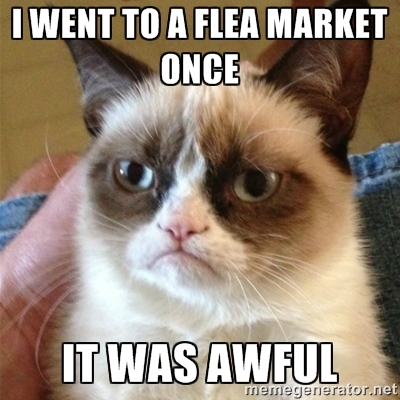 And if I’m not funny today, you can blame that, because if you’re expecting a ginormous yardsale and all you get is a bunch of people selling pieces of garbage they glued together, you’re basically gonna be Grumpy Cat for the rest of the day.